Melissa Gilliam MD, MPH, is Professor of Obstetrics and Gynecology and Pediatrics at the University of Chicago. She is the Ellen H. Block Professor of Health Justice. In November 2012, she launched Ci3 at the University of Chicago to create research to describe and address the intersections between inequitable systems (e.g. education, economic, health) and the well-being of adolescents and young adults. Ci3 works with and on behalf of young people marginalized by race, class, and sexual orientation taking an asset- rather than risk-based approach to addressing sexual and reproductive health, educational attainment, physical safety, and economic security. Ci3 uses storytelling, game design, and technological interventions to empower young people and create policy change domestically and internationally. Based on the success of games as a medium, Gilliam and Jagoda are now working on a new large-scale collaboration: Transmedia Story Lab, an entity devoted to studying narrative and its effects on the lives of young people. Specifically, Transmedia Story Lab will be a place for exploring the application of humanities-based theories of narratology (the study of narrative forms and the ways that they affect human perception) and narrative techniques across media (e.g. in subfields such as electronic literature studies). Transmedia Story Lab will explore the mechanisms and forms through which narrative might influence the well-being of youth and the larger systems and policies that affect their lives. Transmedia Story Lab will open up new research areas, interdisciplinary methods, and collaborative projects. We plan to explore stories in three ways: as methods for public health research, as processes to empower young people and structure new media curricula, and as polished outputs for wide dissemination. Collaboration with Soundarajaran will help to galvanize this work. Other collaborators in our work in transmedia storytelling are listed below. Patrick Jagoda is Associate Professor of English, and an affiliate faculty member in Cinema and Media studies and the Center for the Study of Gender and Sexuality at the University of Chicago. He specializes in new media studies, digital storytelling, contemporary American literature, and digital game theory and design. 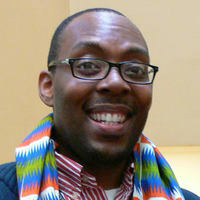 He is co-editor of Critical Inquiry and co-founder (with Melissa Gilliam) of the Game Changer Chicago Design Lab. He co-edited two special issues: “New Media and American Literature” for American Literature (2013) and Comics & Media: A Special Issue of Critical Inquiry (2014). Two of his books will be published in 2016: Network Aesthetics, and The Game Worlds of Jason Rohrer (co-authored). 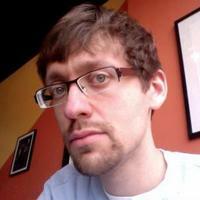 In 2012-2013, he held a Gray Center Collaboration grant entitled “Alternate Reality: A Pervasive Play Project.” Alongside his academic work in the humanities, Jagoda has worked on a number of digital projects with youth on the South Side of Chicago, including an interactive narrative about teen decision-making and sexual health (Cache), an alternate reality game about economic and health disparities in America (Stork), a transmedia story with mini-games about sexual assault (Lucidity), and two citywide games about youth civic engagement and collaboration (The Source and S.E.E.D.). Márquez Rhyne is the Director of Ci3's Transmedia Story Lab. In this capacity he leads narrative-based interventions and projects addressing adolescent sexual and reproductive health. He comes to this work as a cultural organizer with over 20 years of experience. His previous collaborations include the AIDS Foundation of Chicago, Alternate ROOTS, Center for Digital Storytelling, Highlander Research and Education Center, University of Chicago and the Kaiser Family Foundation’s Speak Out HIV campaign. Over the last 20 years, Rhyne has amassed experience in nonprofit administration, diversity training, resource and workforce development, and cultural organizing for social and economic justice campaigns. Rhyne is also a performing artist, playwright, director, writer and producer for documentaries and training videos. Thenmozhi Soundararajan is a New York-based transmedia artist and theorist. As one of the founders of community digital storytelling, Soundararajan has used narrative art and media to further social justice and human rights causes in the United States and abroad. With the support of entities such as the Robert Rauschenberg Foundation and MIT’s Center for Civic Media, Soundararajan has brought together scholars, artists and activists to combat caste-based violence in India using transmedia narrative art through her project #Dalitwomenfight. Since 2012, she has captured the repercussions of India’s caste system on marginalized communities through the Robert Rasuchenberg project #Dalitwomenfight. These stories have since been distributed using several channels, such as through an international, multimedia campaign, a speaking tour around the United States, and in a final documentary and art exhibition (still in production). 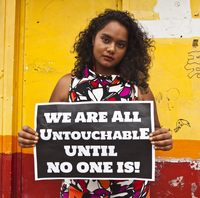 In addition to this extensive work with caste-based violence in India, Soundararajan has led many projects to document the stories of youth, communities of color, immigrants, and women in the United States. She has also written, directed, and produced a number of her own films and interactive media pieces. Examples include What Would MLK Do?, a film screened in classrooms across the country as part of a national day of action, and Love In The Time of Genocide, an interactive comic for iOS devices. Her work has been recognized by the Producers Guild of America’s Diversity Program, The Museum of Contemporary Art, Chicken and Egg Foundation, The Annenberg Innovation Center, Slamdance, The Sorbonne, Source Magazine, Utne Reader, The National Center for the Humanities, The National Science Foundation, The Indian Film Festival of Los Angeles and The Alfred P. Sloan Foundation.